If you have been told once, you’ve been told a hundred times…you have to be involved with social media marketing. It’s the wave of the future; it’s the new paradigm for customer engagement, blah, blah blah. So you’re out there tweeting, posting status updates on Facebook, Digging, Diigoing, Stumbling and posting content on YouTube. But do you know how well you are doing with all of these social media tactics? Are you monitoring the effects of your social media outreach? Many times the effects of this outreach can go beyond simply driving traffic to your site. You have to monitor and measure the social chatter. Do you know if most of the time people are mentioning your business or brand in a positive, neutral or negative manner? How about the number of unique people talking about you? Would you like to have a way to know precisely who is talking about you across the social web? That sounds hard you say. That sounds expensive you think. Oh ye of little faith. If you are not ready to invest in a pricy monitoring tool, you can easily use a free social monitoring tool called SocialMention. SocialMention will aggregate all “mentions” across the social web including social networks, news and blog posts into a single social media dashboard. Let you know immediately if you have an image problem, a problem that can be addressed in several ways, including, you guessed it, with social media. Let you see if you have any brand evangelists or grumpy customers, people you can reach out to with a “thank you” or “how can we do better”. Again, you can do this via social media. Let you see where people are who are talking about your brand. Are most of the mentions on Facebook, Twitter or somewhere else? Very helpful when you are planning a social media campaign. 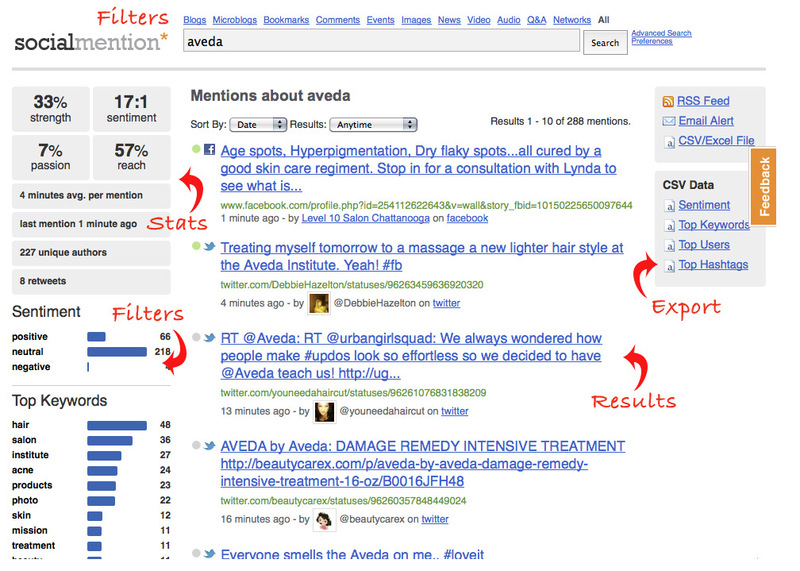 And finally, let you see at a glance if your social media campaign is paying off with more and better mentions. Start by typing your company name or brand in the search field. Sit back and wait for the results. That’s it. But if you want to get the most out of this social media monitoring powerhouse tool, read on. At the very top, you can select to view all results or only those that come from blogs, news, or comments, etc. In the middle, you see all the results which you can sort by data or source. Additionally you can see the results just for the past month, the past week, or even the past hour. Along the left hand side you’ll see two sections: Stats and Filters. If you roll over one of the stats boxes such as “sentiment” you’ll see a nifty popup that will explain what the number means. The filters will show you at glance things such as the top keywords people are using, the top users who are talking about and well as how many mentions are in that “filter.” Want to see just the mentions for a single keyword or user? A single click of the filter will show you just the results you want. Click around to see how things changes. You will see that the stats (strength, sentiment, passion, and reach) will change each time you dig deeper. This is important. It shows you how a particular segment feels about the brand and as we mentioned in a previous post, segmenting data is very useful. Ever wonder what keywords most people are using in their social media conversations? Or the top hashtags they’re using in Twitter? It can even help you measure ROI…sort of. What’s it worth to you to have lots of people talking about your brand in a positive manner? What’s it worth to you to easily spot the people who talk about you the most? What’s it worth to you see those people spread your message? I’m not going to lie. Determining ROI with social media can still be a lot of art and a lot less science but having some numbers to work with that you can use to compare against customers and sales per campaign will start to make social media ROI more concrete. Additionally you can use it for competitive intelligence. Monitor your competitor’s brand and see if you can gain some insight into how they are connecting with their customers.